I have been traveling to Maumee, Ohio for the annual walleye run for many years now. Every spring I look forward to the chance of landing into a big one. The Maumee River is located in Lake Erie's western basin. 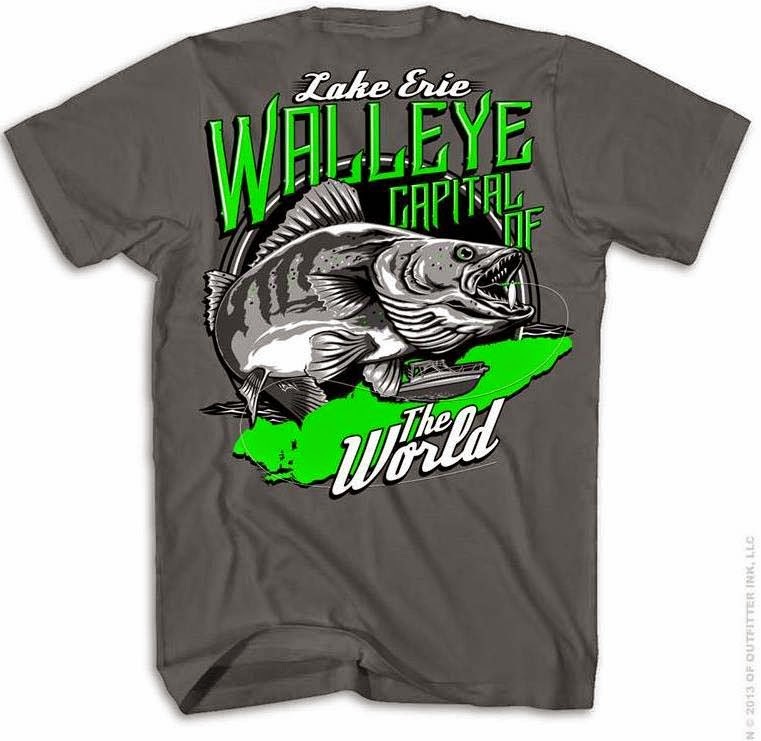 Every spring the walleye migrate from Lake Erie into the Maumee River to spawn. This spawn makes up the largest walleye run east of the Mississippi River. The start of the run differs from year to year. Most anglers start fishing for the walleye in early March, but the local say that they start fishing a couple weeks after the ice is through melting. The start of the run depends on two aspects; the weather and water temperature. The more rain in the forecast, the more water flow that will be coming out of the river. The walleye need the water flow to be up to get into the river. If there is a minimum flow out of the river, then not as many fish can get up river. Even if there is the right amount of flow coming out of the river, the water temperature needs to be right for the fish to start the run. The water that reaches the lake needs to be between 35 to 40 degrees to trigger the walleye to migrate up the river. The fishing technique that most anglers utilize is the swing technique. This consists of throwing your line straight out in front of you and letting your bait swing downstream. As your bait is swung downstream it will be bouncing on the bottom. Once your bait swings downstream, reel your bait in with a slow retrieve. 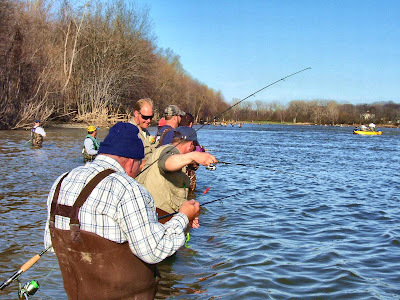 This technique is the best for the Maumee River because of the amount of people that will be fishing. This trip will definitely be a crowded one. There will literary be hundreds of anglers lined up and down the river. Most anglers use floating jigs with a twister on a Carolina rig. The Carolina rig consists of a swivel, an 18" leader, a slip sinker, a floating jig, and a twister. To make a Carolina rig: 1. 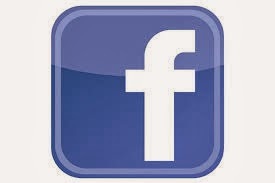 Make a 18" leader of line. 2. Put your slip sinker on your main line. 3. Tie on your swivel to main line (The swivel acts as stopper for your slip sinker and also gives you something to tie your leader onto). 4. Tie your leader onto the swivel. 5. Tie your jig onto the leader. 6. Put twister on jig. The anglers use the Carolina rig to prevent snags, the river bottom is very rocky. The females migrate to these rock beds to lay the eggs. The run usually lasts from March to the first part of May. During the run, there will be fresh fish coming into the river when the water levels are up. From past experiences, a great time to fish is when the water level is descending. At this point the high water levels are going down, and the high water levels bring fresh fish into the river. These fresh fish will be more willing to bite because they have not yet spawned. The peak of the spawn is usually the second or third week of April, but can differ from year to year as well. The best time to catch the big females is in the pre-spawn to the peak of the spawn. The females are the first to migrate into the river, and this is why anglers are trying to fish the very first run to come into the river. During the post-spawn most of the females migrate back to the lake, but the jacks stay in the river to feed. Hopefully this was helpful to anyone looking to make the trip up for the walleye run.